Ranjeev C Dubey is a corporate lawyer, author, public speaker, business columnist, blogger and keen hobbyist. Apart from his professional pursuits, his interests range from travel and food journalism to photography to videography to off road wilderness journeys to scale miniature railways and radio control helicopters. In the main, Ranjeev C Dubey is the managing partner of the N South, Advocates, the premier independent full service law firm located in Delhi’s fastest growing commercial hub in Gurgaon. 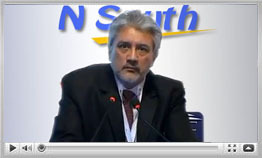 N South Advocates is recognized for its guidance of cutting edge corporate transactions and complex litigation briefs. He is the team leader on many of the firm’s leading assignments, rendering advice and steering the strategic input at the pulse of the commercial issues. Ranjeev C Dubey is and has been an acclaimed speaker at a wide variety of domestic and international business and legal conferences over many years. He has also over the years been the principal trainer at a great many legal training workshops for business executives. He continues to appear at business forums, providing perspective to the business and legal issues faced by commercial entitles in India’s evolving business landscape.